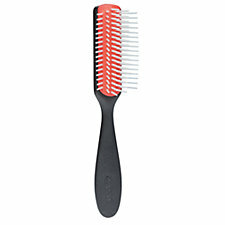 THE TRADITIONAL STYLING BRUSH #D143 (For Controlled Styling) : Brushes that are suitable for all hair lengths and types. Anti-static red rubber pads with close-set white nylon pins provide maximum grip and control for smoothing, shaping and polishing the hair. Same as the D14 except all components are black in color. 5 widley spaced rows, standard size.